Telnet is the traditional and very old protocol (similar to SSH) for remote console connections over TCP/IP. The telnet communication software is a user text mode interface to the TELNET protocol. Default protocol is TCP and port is 23. Telnet protocol was created in 1969 used to remote of systems over Network via text mode. The telnet command is used for interactive text communication with another server or client using this protocol. Telnet is two sides: the server-side service and client program. 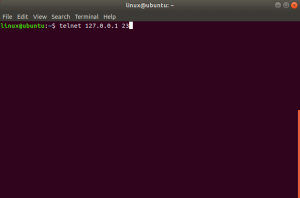 With telnet you can connect to a remote Linux computer or run programs remotely and general plan of administration. If required you could change access permissions and allow root user login to telnet server. To do this you have to modify the /etc/security file. Telnet Commands: USER, PASS, LIST, RETR, and DELE.